With its medium-telephoto focal length and astounding image quality, the AF-S NIKKOR 85mm f/1.4G is ideal for portraits and general photography. 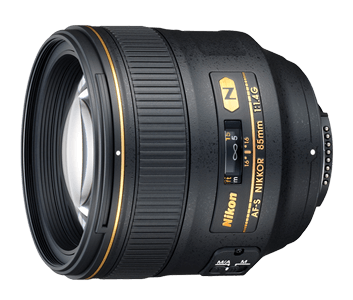 Its ultra-fast f/1.4 maximum aperture produces a stunning bokeh effect that will beautifully isolate your subjects. Featuring a rounded nine-blade diaphragm, this lens produces natural and smooth background defocusing. Low-light performance and clarity are also enhanced by the wide aperture. This lens delivers impressive performance in studio or outdoors, in bright light or at night. Its lens elements feature our Nano Crystal Coat technology to effectively minimise ghosting and lens flare. For superb colour and contrast, our Super Integrated Coating (SIC) enhances the flow of light through the lens. Complementing these technologies is the Silent Wave Motor (SWM), which provides extremely smooth, quiet and precise auto-focusing for both general shooting as well as extreme situations. The lens also features a handy M/A mode for seamless switching from autofocus to manual operation.